Fuefukigawa Fruits Park (笛吹川フルーツ公園) is one of the popular tourist spot in Yamanashi city. It has a great view of Yamanashi Basin and Mt. Fuji. The night view from this park is chosen as the new three best views of night sceneries in Japan. Therefore, this place is also chosen as the Holy Land for Couples. At the gift shop, they have all kinds of Yamanashi products especially fruits that are very popular in Yamanashi. Also, they have the great collection of Yamanashi wine. This park also has a lot of Kid's facilities that many people visit here at weekend for their family activities. 2. use local bus to Fuefukigawa Fruits Koen. Fuefukigawa Fruits Park is the public park of Yamanashi city where you can see the great view of Mt. Fuji and Kofu Basin. 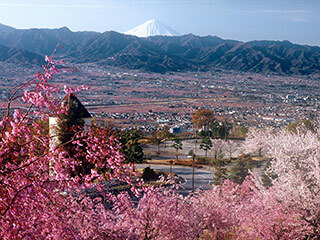 Yamanashi city is known as the land of Fruits. Therefore, this shop has all kinds of fresh fruits produced in Yamanashi city. Also, it has a great collection of Wines. Over 160 wines from all over Yamanashi prefecture are in this shop. Not only the view and fruits, this park has Onsen facilities, hotels, stages and tons of kids facilities for family activities. There is a in-park train for access from upper parts and lower parts.